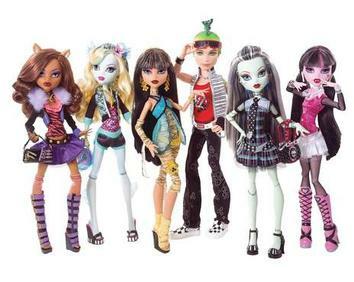 Created in 2007, but not released until 2010, Monster High is an American Fashion Line doll that features a unique spin on monsters from pop culture; like Frankstein's Monster and Dracula. For example, Draculaura is the daughter of Count Dracula and Frankie Stein is the daughter of Frankenstein. 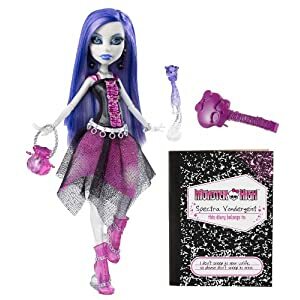 Other notable characters include Clawdeen Wolf, daughter of a werewolf; Lagoona Blue, daughter of a sea monster; Cleo de Nile, daughter of the Mummy; Deuce Gorgon, son of Medusa; and Ghoulia Yelps, daughter of the Zombies. In 2010, the Monster High website was launched with features that includes games, downloads, and other activities. 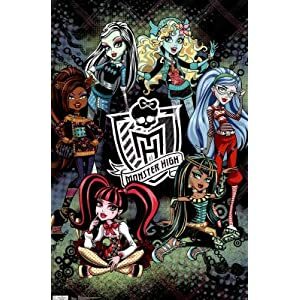 Other Monster high tie-ins include the Monster High: Ghoul Spirit game for Nintendo Wii and Nintendo DS, a cartoon series, party supplies, and even a film adaptation being written by Alfred Gough and Miles Millar. One of the most popular Monster High fan sites is MonsterHighDolls.com. Fans can create their own accounts, chat, share photos, and post on the forums. The creator, Deuce, is also very active with the community. Deviant Art is also a cool place to go for some fan made Monster High art. One of my favorites is the Lagoona Blue piece by Kharis-art. If you have a daughter or family member that loves Monster High then throwing them a Monster High themed party for their birthday or other special event would be a huge hit. However, if you plan to do this you'll need to know a few things, first. That way, you can plan your budget accordingly. Provided below is a guide that will go over the steps for planning your party. Starting with gift ideas, the steps also cover other areas like activities, invitations, and even ways to tell people about the party. Determine your overall budget for the party. Search the Internet for some cool activities that you can tie-in to the Monster High theme. Or, create your own idea! Decorate the location with the Monster High theme and make sure you take pictures of the party before, during, and after! Share your party with the world. Post images and share your experience with people on your blog or social sites, like Facebook or Google+. People love checking out images and information on parties. Some of the steps, like the first (gift ideas) and third (party supplies) can be expensive, depending on what you buy. While others, like the second (activities) and seven (sharing the party) can be fairly cheap, but time consuming. The most important thing is finding the right gift(s); especially for birthdays. As mentioned above, there is the Monster High: Ghoul Spirit game. Another obvious gift idea are the Monster High Dolls, but the prices can range from $30 - $50 (mainly the originals) for them. However, there are some cheaper dolls priced around $10. Check out Amazon for other great Monster High gift ideas. First, find out the person's favorite Monster High character. Then, check out some of the Monster High art on Deviant Art until you find a few artists that you like. Find out a little information about each artist, their general rates, and further comments about them as a reputation check. Then, contact the artist you like and ask them about doing a Monster High commissioned art piece (traditional art/painting, non-digital). It's also important that they have enough notice so the art is done in time for the party. Make sure the artist knows what they're doing as well; in terms of shipping. The actual surface should never be touched by the packaging. A stiff cover over the top and bottom of the art, along with spacers to prevent this cover from touching the top of the art is a must. Protective surface coating for art will help preserve the image better (and longer), as well. Basically, don't skimp on the protection, packaging & shipping. You absolutely want the best packaging & shipping, along with shipping insurance. The last thing to keep in mind for this gift idea is the age/maturity of the person receiving it. Kids tend to want to touch and play with their gifts. So art (which is expensive) tends to get ruined. However, if you feel their responsible enough, go for it! I think any Monster High fan would ABSOLUTELY love it. Choosing the right party supplies -which, of course, depends upon budget- is important. For someone that doesn't have that big of a budget, picking out purple and black colored plates and cups would work. However, another relatively inexpensive idea are Monster High Party Supplies. These themed party supplies come in various packs ranging from standard ($25) to ultimate ($120). Each pack is designed for eight guests. The party favors, like the Light-Up Button and tattoos would make an excellent addition to the party. Other party supply ideas include Monster high themed decorations like balloons, candles, and birthday banners. All of which is inexpensive and makes the party that much better! The invitations can be as simple as picking them up at a local store. More time consuming -but way cooler- is finding Monster High images online then printing them out and creating your invitations. For those who don't have enough time to do custom invitations, Monster High invitations is an obvious choice if you want to maintain that consist, overall Monster High theme throughout all aspects of the party. At around $4 for a pack of eight, they're relatively inexpensive and look great as well. I'd love to see some of the invitations that people create for their parties. Message me with a link to your creations and I'll be sure to feature them here, along with giving credit to you. Share your own Monster High ideas with us. Or, tell us why you like Monster High.